This one made us smile, the majority of the images in the book we are assuming will focus on architecture and the urban scene in general but this image with the human element just sums up that sinking feeling of a terrible town. Whilst working as English teachers in Poland, Tomek and I would often ask our students where the worst place in Poland was. The unanimous answer was Katowice. 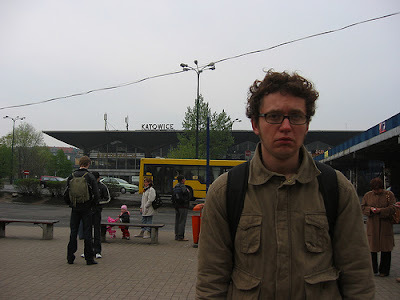 We decided to make a journey around Poland by train and made a point of stopping off in Katowice. The weather was suitably ominous, and we were greeted with a crumbling mass of dirty grey concrete. Katowice was truly breathtakingly dull and average, and we spent about ten minutes loitering around the station taking it all in, took this photo as a memento, and left on the next train. It turns out Katowice was all we hoped it would be, because for the rest of the journey we were in awe of the beauty Poland has to offer elsewhere. To take part you can simply upload your photography to our Flickr Pool, Worlds Worst Urban Spaces and Place including a description of between 100 and 250 words. The image and text will then be used in a post and included in the forthcoming book written in the spirit of Web 2.0 by readers of this blog. I got to school in the city and i agree 100%.